The process of converting alternating current into direct current is rectification. Any offline power supply unit has the circuit for rectification which converts either the AC wall supply into a high voltage DC or stepped down AC wall supply into low voltage DC. The further process will be filtering, DC-DC conversion and etc. So, in this article we are going to discuss Simple Bridge Rectifier Circuit, which the most popular method for full wave rectification. Transformer 230VAC / 6VAS – 1nos. Resistor 1 kΩ - 1nos. In very simple terms, a Rectifier is a circuit that converts an AC signal (Alternating Current) into a DC signal (Direct Current). It can be also said that a rectifier converts a bi-directional current into uni-directional current. Diodes are used to build a Rectifier circuit because of their uni-directional conduction property. Semi-conductor diode conducts only when it is forward biased (it behaves as close switch) and it does not conduct when reversed biased (it behaves as an open switch). This diode characteristic is very important and is used in construction of the Rectifiers. Half wave rectifier only converts half of the AC wave into DC signal whereas Full wave rectifier converts complete AC signal into DC. Bridger Rectifier is the most commonly used rectifier in electronics and here we will only study that one. 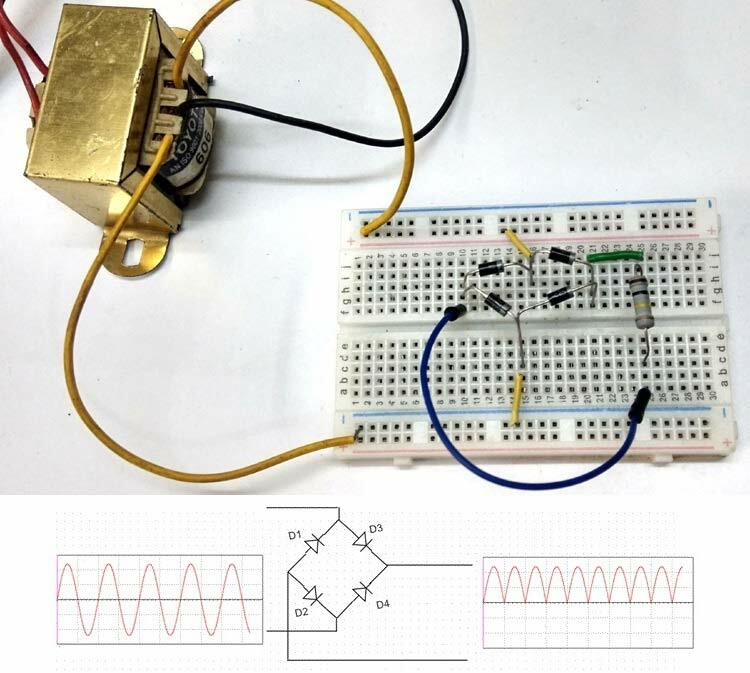 If you want to learn about half wave rectifier and center tapped full wave rectifier then follow the links. Full wave bridge rectifier is formed by connecting four diodes together in such a way that their arms form a bridge, hence the name bridge rectifier. In bridge rectifier, volatge can be applied to the diode bridge through a transformer or directly through the AC signal without the transformer. During the positive half cycle diodes D3-D2 get forward biased and acts like a closed switch. Diodes D1-D4 and gets reversed biased and do not conduct thus acts like open switch. Thus we get positive half cycle at the output. During the negative half cycle diodes D1-D4 get forward biased and acts like a closed switch. Diodes D3-D2 gets reversed biased and do not conduct thus acts like open switch. Thus we get positive half cycle at the output. Below wave form is showing the input and output waveform for Bridge Rectifier Circuit. We can see that the negative part of AC voltage in converted into positive cycle after going through Bridge rectifier circuit. The output after the Rectification is not a proper DC, so we can smooth out the waveform using a Capacitor for filtering purpose. Capacitor charge till the waveform goes to its peak and discharge into Load circuit when waveform goes low. So when output is going low, capacitor maintains the proper voltage supply into the Load circuit, hence creating the DC. It reduces the ripple factor and provides proper DC. A voltage regulated can be further added for regulated DC supply. Learn more about Half Wave and Full Wave rectifiers here.